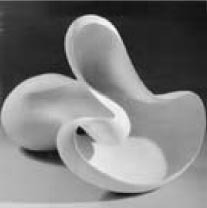 This research website considers the process that can be used in the development to construction of a freeform (biomorphic) maquette. The maquette was constructed in polystyrene and was made by one of our staff (Grace Simmons) over several lunchtimes. A decision was made early on to work in this way as we wanted to begin with a physical model that we could touch and feel rather than a digital model that would not have the same sensory value. The idea was to create a form that was independent of scale and could be the first draft of a sofa for a lounge or the outline of a new gallery building. The maquette underwent a number of processes including laser scanning, surface modeling, finite element analysis and rapid prototyping. The purpose was to explore these techniques, their crossovers and establish a pathway for the delivery of this type of form. We hope that you will find our research of interest and if you have any queries or would like to collaborate on a project please do not hesitate to contact the office.